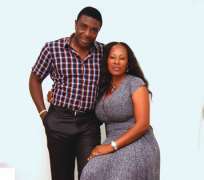 A few days ago, some element of people syndicated a story that the stylish actor, Bob Manuel Odogwu's wife, Cassandra was dead. The so called bloggers wrote that a certain houseboy whom the couple brought from the village strangled the wife to death. Miffed by the condolence messages and calls received by the former host of Ultimate Search, a Nigerian Breweries sponsored reality show, Bob Manuel came out to react to the said story. Here is what he said, "Stella my wife is still alive by the Grace of God and she is not sick or recovering from strangulation. I don't know where this story is coming from,she was even the one that forwarded the story to me so you can imagine that she was in shock reading that she had been strangled to death." He explains in detail, "My wife was present in my home town Ogidi on Thursday September 26,2013 some days after the report say she was strangled and she stayed for two days for my mum's burial .We both celebrated New Yam event in a neighboring town Umudioka on Saturday September 28,2013 28th Sept. She left for Lagos on Sunday September 29,2013 and is at home celebrating the independence with my kids right now. And about the rumour, 'I don't know where this wicked rumour is coming from and i reject it.I don't know how people can just publish stories without confirming first,especially when it has to do with such a serious matter as death. Bloggers should really check themselves and how they spread news that is not true. They should rush to publish bad news when it can be verified.